As noted previous my blog has been restored without content and I am publishing old posts from the past. Every now and then I capture a photo that I basically like, but it just has something missing. 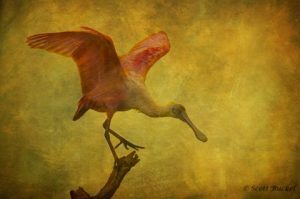 This image for example had a ugly sky that took away from the action of the Roseate Spoonbill as he was starting to take off. I used a number of files to give texture to the boring listless sky. This is a case that took an OK image to something interesting in my mind.